Who or what is your favorite Halloween story or character from pop culture? Many of us would say “The Exorcist” or give you the name, Freddy, Jason, Leatherface or Tammy Faye Bakker. Before you say another word, let me tell you what I did this Halloween evening. I spent a little more than two hours in a dentist’s chair getting three fillings and a root canal. “The horror!” Actually, my dentist is great and much better than I deserve. After spending the first 25 years of my life making candy, cookies and ice-cream the staple of my diet (no exaggeration, trust me) and exercising less than optimal dental care, I have been paying the price to the dentist for the past 12 years or so. The thought of all those wonderful Halloweens coming back to haunt me in this way! Ironic horror, or not ironic at all? Take care of your teeth, kids. Today’s photo is not really representative of autumn, but it is an example of something I’d prefer to be munching on these days and about as close to a Halloween image as I could come up with. 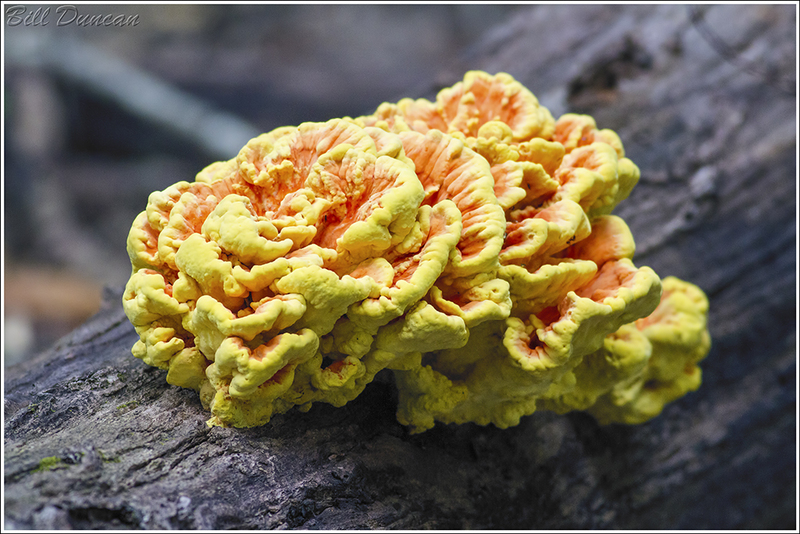 This sulfur shelf polypore is more commonly known as chicken of the woods. It is so named due to a texture that is similar to that of chicken meat. The one sample of this I took for eating was quite tough; most often the outer edges of the youngest leaves are most fit for eating. I do look forward to trying this again with a more sophisticated recipe. Unfortunately I had my bird equipment on this outing and this was as best an image I could make of it. Bill, That’s funny I just posted all mout the same photo on FaceBook today.